Collectors were recently reintroduced to the 1992-93 Fleer Ultra design thanks to 2012-13 Fleer Retro Hockey from Upper Deck. The original cards are gorgeous. For their time, they were considered a premium issue. Featuring a high-gloss, full-bleed action photo, the player image takes center stage. During the early 1990s, the use of foil printing on cards was in its infancy and used sparingly. The Fleer Ultra logo is located either at the top right or top left of the card, wherever it did not interfere with the photo. Tucked nicely at the bottom of the card is a diagonal swath of light blue representing a scratched-up ice surface. Two bars across the surface hold the player’s name, position and team. 1992-93 Fleer Ultra Hockey card backs are also planned out well. They are arranged in a horizontal landscape design, with a background that resembles a hockey rink. Two additional player photos grace the card backs. One is a full-length body shot and the other shows the player from the shoulders up. The fact that all three photos on the card are different is a testament to the care and pride that went into designing the set. The team logo and card number are prominently displayed with the card number positioned in the upper right corner, making for easy sorting. The player’s biographical and statistical information is included on the card back as well. The manner in which the set checklist is configured is one of the best features of 1992-93 Fleer Ultra Hockey. The players are sorted by team and the teams are spread out alphabetically. For example, all of the Boston Bruins kick off the set. This structure makes team and player collecting much easier. 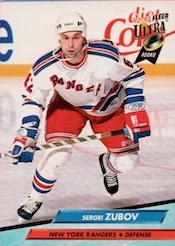 1992-93 Fleer Ultra has a total of 43 rookie cards in the set, most of which are found in Series 2. Notable players include Roman Hamrlik, Bill Guerin, Sergei Zubov, Martin Straka and Igor Korolev. Also of note is that the rookie card checklist is dominated with players of Russian descent. 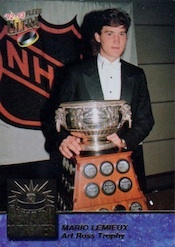 With the fall of the Berlin Wall and the Soviet Union, the opportunity to play in the NHL became a reality. 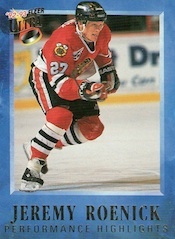 Performance Highlights features a young Jeremy Roenick of the Chicago Blackhawks. The set can be a bit difficult to complete today. 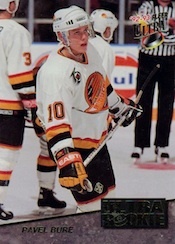 The first ten cards were available in packs and are relatively common. However, the final two were only available through a mail order offer. Additionally, collectors can pull a Jeremy Roenick autograph card. These were allegedly seeded 1:8,000 packs. Series 2 has just one insert set. 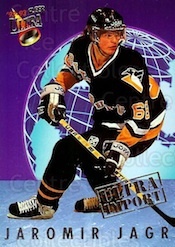 The 25-card Imports insert includes many players from the aforementioned Russian migration that hockey experienced in the early-1990s. 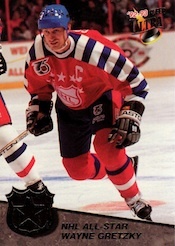 1992-93 Fleer Ultra Hockey was the sport's first set under the Ultra banner. It is still a fun set to look for at shows and purchase for a reasonable price. At only $10-$20 a box, you’re not going to retire with what you pull, but you are going to enjoy opening packs and putting together a set of cards that holds significance in the history of collecting. You can listen to more insight analysis and commentary about the set on the Wednesday, October 23rd, 2013 episode of Cardboard Connection Radio. 1992-93 Fleer Ultra 25th Anniversary Buyback Autograph Owen Nolan #13 25!!! This series most beautiful in 90s. Photos crystal clear in action. Even cheap set but cards look great. Cheap nostalgia, exceptionally beautiful cards (this design was spread across to all 4 NA sports that year and absolutely stunning). Have you seen these cards autographed? Black ink autos look incredible, my regret was not to bring more of these to get signed when I was young but at least I managed to get a couple decent sigs (Theo Fleury, Mark Recchi, Eric Lindros, and Adam Oates). The high gloss finish may lead to smudging of the auto when sleeving it. Boxes shouldn’t cost you more than $20 plus you have a long odds shot at a Roenick auto. For a challenge, these cards have been inserted in 16-17 Fleer Showcase. These buybacks are stamped, #’d to 25 on the front and some are auto’d (with a separate COA).